Avengers: Endgame is all set to release by the end of this month and every Marvel fan is rooting desperately for it. The wait is unbearable as MCU has many answers to reveal to the audience. After wiping out half the universe, including some of our beloved superheroes, in Avengers: Infinity War, the remaining heroes will be fighting till their last breaths to save the universe from the wrath of Thanos. Endgame could be the last movie to feature some of the actors and hence, we can certainly say, that it is an End of an Era. This includes Robert Downey Jr., Chris Evans, Mark Ruffalo, Chris Hemsworth, Scarlett Johansson and Jeremy Renner. Avengers EndGame New Footage Has Captain Marvel Stir Up Captain America, Thor and Others to Take the Fight to Thanos – Watch Video. 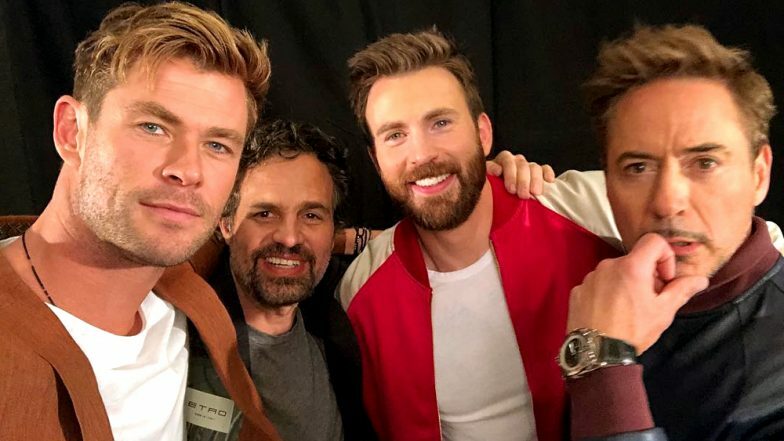 Recently, in an interview with Associated Press in LA, Mark Ruffalo and Chris Evans revealed about their last day of shooting Avengers: Endgame. Mark and Chris were paired for the promotion of the film. When the actors were asked as to who was the most emotional on the last day of shooting the film, Mark revealed, “That was probably Scarlett. She usually gets really emotional.” However, the Russo Brothers (Joe Russo and Anthony Russo) denied it saying that Scarlett did not get emotional. On the contrary, Don Cheadle quipped that Mark was the one who got emotional. To this, how can our superheroes hide that laughter? Chris Hemsworth and Brie Larson enjoyed all the bantering! Chris added, "I was pretty teary-eyed. It has nothing to do with the plot. It's just the fact that it's the culmination of a really long endeavour. It wraps up the journey for a lot of the characters." Marvel Streams 10 Minutes of Avengers Endgame Footage, Russo Brothers’ Film’s New Set of Spoilers Hits the Internet. All the anticipation and curiosity will be answered soon. Avengers: Endgame is slated to the hit the theatres on April 26. Let us know how excited you are. Stay tuned for more updates.